Typically, hearts, flowers and red gems carry the day in sending messages of love. 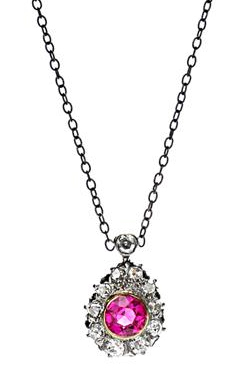 This pretty necklace is made by Estate of Grace using vintage charms. This charm is described as Victorian, platinum over 14k yellow gold. A ruby is set in the centre, surrounded by diamonds. No carat weight is given. It is not specified, but in the description by vendor Greenwich Jewelers it indicates there is oxidized sterling silver, which I am guessing is the 16 inch chain. Available for USD $825. Let love reign.